Diagenode’s iDeal ChIP-qPCR kit is a highly optimized solution for ChIP-qPCR assays. The kit provides high yields with excellent specificity and sensitivity. The iDeal ChIP-qPCR kit used with our highly validated ChIP-grade antibodies provides you with excellent, reproducible results from each experiment. Check out the information about the automated version of the kit: Auto iDeal ChIP-qPCR. Ideal for histone and non-histone proteins – Use 1 million cells for histone marks or 4 million cells for transcription factors. The protocol allows the use of fewer cells per IP. The minimum number of cells will depend on the abundance of the protein in your sample. Suitable for cells and for tissues samples – For tissues, use 7 mg per IP for histone marks or 30 mg per IP for transcription factors. The protocol allows the use of less tissue per IP. The minimum amount of tissue will depend on the abundance of the protein in your sample. ChIP was performed on human HeLa cells using the H3K4me3 (Cat. No. C15410003) and CTCF (Cat. No. C15410210) antibodies. IgG was used as a negative control. 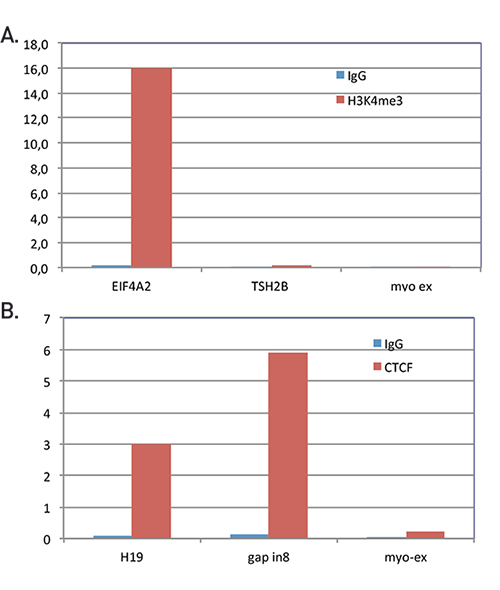 The IP’d DNA was analyzed by qPCR with the following primer sets: EIF4A2, used as a positive control, and THS2B and Myoglobin exon 2, used as negative controls for H3K4me3. H19 imprinting control region and GAPDH intron 8, used as positive controls, and Myoglobin exon 2, used as a negative control for CTCF. The figure shows the recovery, expressed as a % of input (the relative amount of immunoprecipitated DNA compared to input DNA after qPCR analysis). Diagenode strongly recommends using this:	iDeal ChIP-qPCR Kit (Diagenode Cat# C01010180). Click here to copy to clipboard.